There are certain times in the year when we look to renew and refresh whether it’s our homes or our lives. At the beginning of a New Year we make resolutions to live life differently or better. September is the start of the new school year and is another time to take stock of our lives before the winter sets in. And Spring is traditionally the time for cleaning our homes. However, before spring cleaning can really begin, it seems to make sense to review all the ‘stuff’ with which we surround ourselves. It’s a lot easier to keep a clutter free home clean. Every item we own takes time out of our lives: the time to earn the money to buy it, time to shop for it, time to manage it, clean it, repair it. Most of us have far too much stuff and we all generally feel better if we can open a cupboard without everything tumbling out. A good rule of thumb is only to have in your home things that are useful or that you love. It’s also a great feeling to have the right tools for the job at hand. I’d recommend the following useful (and rather lovely) pieces of equipment to set you on your way. 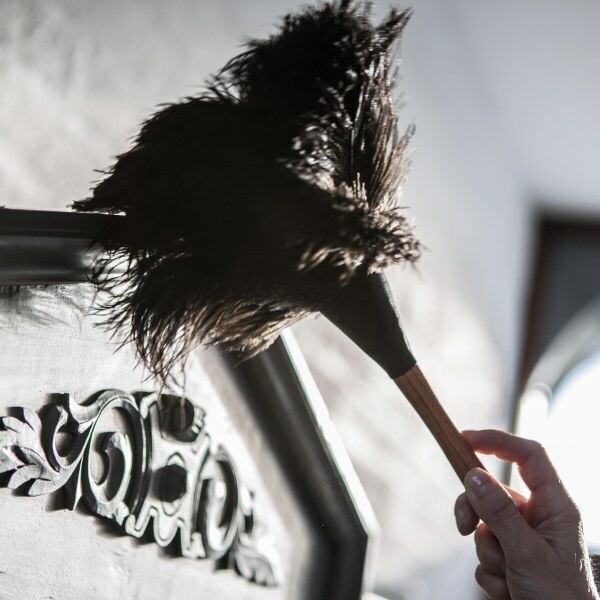 A bucket, scrubbing brush, everyday duster, specialist dusters where required, copper cleaners for dishes, and some natural, effective cleaning products. Today let’s take a look at a good everyday duster. Firstly there’s the Turner & Harper dusting brush. This is the lightest, finest dusting brush you’ll ever hold. Quite beautiful. Very high quality, great ergonomic design and made by a British designer. Perfect for dusting skirting boards, bannisters and books It starts at £22.50. Next is the Redecker Round Spotted Dusting brush at £23.50. It has a pearwood handle and goat hair bristles. Great for dusting around ornaments and in difficult to reach corners. It’s like a very large cosmetic brush and incredibly soft to the touch. Ostrich feathers have a static property that attracts the dust to it and then you simply shake it outside. They’re very light and gentle and good for all surfaces. They cost £11. One of the main things I like about all three is that they have handles. I’m not keen on using a yellow cloth duster as it always leaves my hands dry. With any one of these three brushes I don’t come away feeling grubby and needing to use half a tube of hand cream!